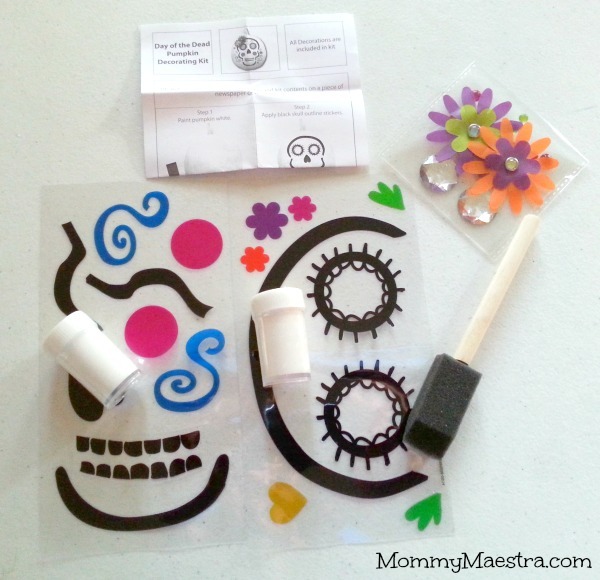 If you follow MommyMaestra on Facebook, you may recall me squealing with glee last week when we found all sorts of fun calavera crafts at my local Target. 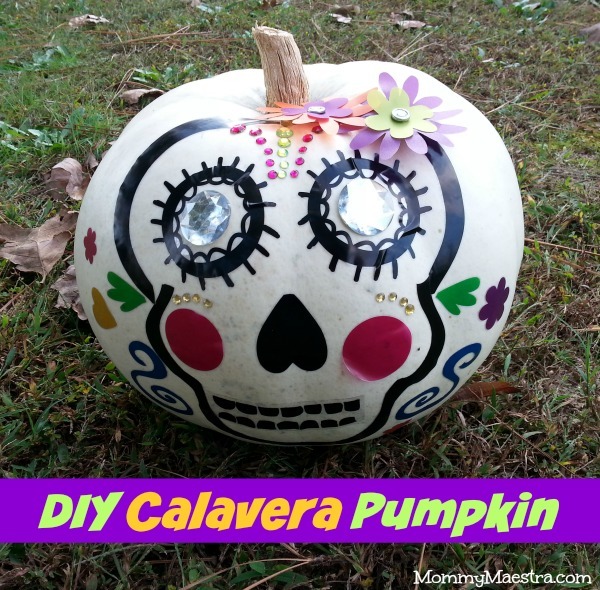 Here's our favorite one: the DIY Calavera Pumpkin Kit. 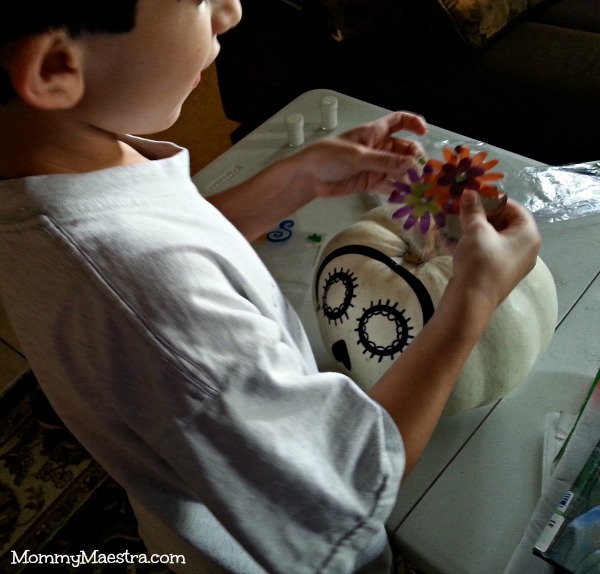 It's easy enough for young fingers to manipulate, but creative enough for adults to love! First, open up your decorating kit and make sure you have everything. But if your pumpkin is the traditional orange color, then you'll need to spread out some newspapers. The kit comes with white paint and a sponge brush, so have at it! 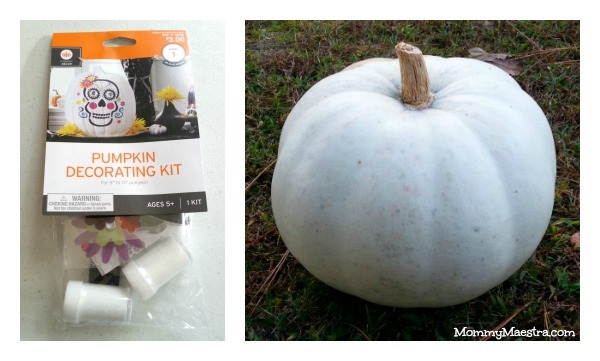 Paint that pumpkin white. Balancing it on a can of soup (or beans, or whatever!) makes it easier to paint the bottom without it sticking to the newspaper. But paint it carefully so you don't knock it off. You may have to steady it with one hand while you paint with the other. Once it is dry, it's time to decorate! The peel and stick graphics make this fun and easy. You can copy the image that comes with the directions, or just use your imagination. Voila! You're done! Is it not pure awesomeness?